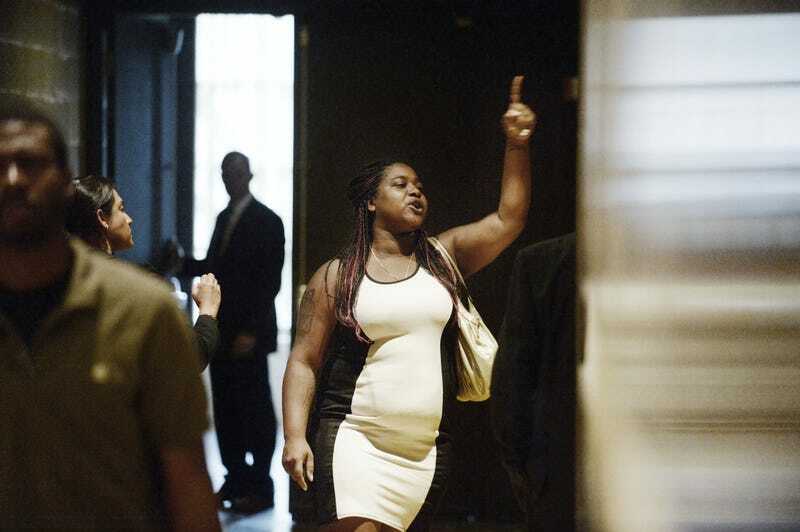 Erica Garner, the daughter of Eric Garner, who was choked to death by a police officer on Staten Island, N.Y., asks to speak with President Barack Obama outside a town hall hosted by ABC to engage directly with officers, parents, students, community leaders and families on issues of trust and safety July 14, 2016, in Washington, D.C.
During Thursday night's presidential town hall on race, hosted by ABC News, Erica Garner, the daughter of Eric Garner, who was choked to death by New York City police in 2014, would not be silenced. According to BuzzFeed, the activist stormed out of a taping of the town hall after she said she felt she had been "railroaded" by the network and denied the opportunity to ask the president a question, an opportunity she said she had been promised. Garner told BuzzFeed that she had an agreement with ABC that she would be able to ask President Barack Obama a question about the Department of Justice's investigation into her father's death. ABC denies that claim. “That was the agreement before I called my brother and sisters and before we got on the train to head to D.C. to do the town hall,” Garner insisted. Garner was particularly frustrated, BuzzFeed notes, because she had cleared time to go to Washington, D.C., even as she plans for the two-year anniversary of her father's death. Attendees at the event described a tense atmosphere to BuzzFeed, saying that as Garner left the stage, she began screaming. Garner said she did not mean to make the president uncomfortable but felt that she had to be "belligerent just to be heard." Garner later met with Obama in a private moment when she got to ask her question. She said the president did acknowledge what happened to her father. “It showed me that he’s human and sees what’s going on, but still, it wasn’t enough. I felt like my voice didn’t matter in that conversation” during the town hall, she added. Garner said she also was not comfortable with ABC News' decision to seat her next to the wives of Police Officers Wenjian Liu and Rafael Ramos, two New York City police officers who were killed days after a grand jury declined to indict fellow Police Officer Daniel Pantaleo, who used the choke hold on Garner's father. Garner told BuzzFeed that she felt that she had been "used for ratings."